The BeagleBoard's OMAP chip has some serious computing chops, and this project set out to prove it. Ever since I built the Open SciCal, I've been showing it off to nerd friends of mine (that's another way of saying, if I've showed your the Open SciCal in the past 2 weeks, I think you're a nerd that would appreciate it - ha). Granted, a single Open SciCal is nice. But the real impressive part is the combination of serious floating point horsepower with low power. I figured I'd do this project to respond to all those people who were skeptical that the Open SciCal had any utility in the modern world. Well... my answer is yes. 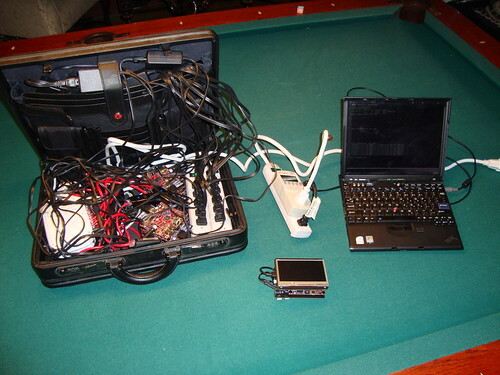 I took 10 BeagleBoards and turned a suitcase into a wifi-accessible, on-demand, elastic R computer cluster that runs at 10 Ghz, 40 Gigs of disk, and 1,000 megabits of networking bandwidth. I did this all for less than $2,000, and spent less than 5 hours building it, and now I have a scalable compute resource that is portable, has performance comparable to mid-range and high end servers that cost $15,000-30,000 from IBM or Sun. And better yet, it all runs at 30 Watts. That's less than most of the incandescent light bulbs in my room right now. I've also made the whole project Open Source, for anyone who wants to replicate it on their own. Personally, I'm going to build another one out of 32 of these suckers, and rent it to the trading firm that bought dozens of Open SciCal's from me in the past couple weeks. 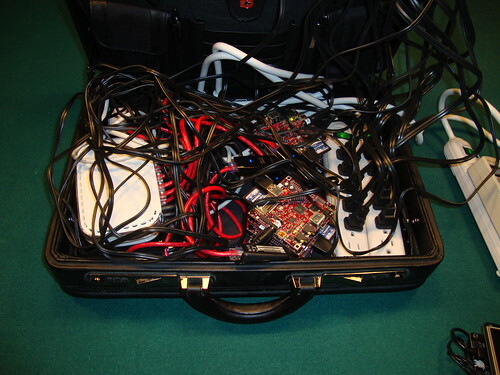 I took 10 BeagleBoards, and used the same standoffs that I use in the Embedded Gadget Pack. I used an offset pattern so they could stack as high as I wanted them to. I built them all the way up to 10, and then decided it wouldn't fit in a suitcase, so I split them up into 2 mini-towers of 5 BeagleBoards each. I went to Radio Shack (begrudgingly because they sold out to the cell phone man in 2000 and have sucked ever since), since they were the only ones open. I bought 1 wireless router with 5 ethernet ports in the back, and then bought 2 netgear hubs (each had 5 ethernet ports). Step 3: Wire the "interconnection backplane"
I've been reading old literature about multicore, multi-processor, scalable computer architectures, and they have a funky way of making simple concepts like "network" sound really complex like "Fat Tree Fishbone N-Way Scalable Interconnection Backplane". 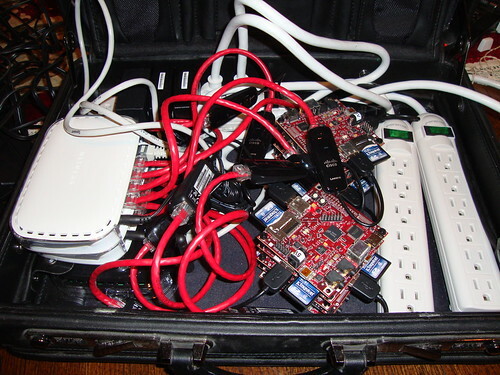 Oh so you mean I plugged the two hubs into the wireless router, and then put 4 wires into each of the hubs, and 2 from the router, and connected them to the BeagleBoards with USB-to-Ethernet modules. I have this new mantra that things I read in hefty academic papers are written in language way too fancy for what they're trying to do. I get the sense that this is intentional, to hide the fact that what they researched could be replicated for $2,000 and 5 hours in modern times. I kid, partially. I'm reading papers written in the 1980's and 1990's, when the idea of doing what I just did would have taken a $10,000,000 DARPA grant. I then replicated the card 10 times, onto each of my SD cards. This was an easy step conceptually, but a pain to do in an organized manner. So I gave up the organization, and just hacked through it. I took 10 BeagleBoard power connectors from the Liquidware shop (specifically those because they're low wattage). And connected them into two small outlet strips. 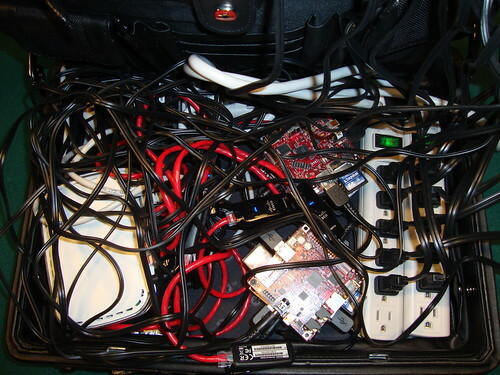 I then routed those power cables around and through to each of the 10 Open SciCal BeagleBoard Compute Nodes. For kicks, I got one of those "kill-a-watt" meters and put it in front of the whole set up, so I could measure how much power the whole thing consumed. Parallel architecture guys are always labeling nodes "master" and "slave". I think it's some hidden repressed anger at the fact that most of us "nerds" never got picked first for kick-ball and 4-square (the game, not the GPS website) when we were kids. Take that, 2nd grade. Now look who's deciding who's "master" and "slave". Me. In all seriousness, at this point in the project, I had 10 networked Open SciCal nodes. But no way to issue code to them. 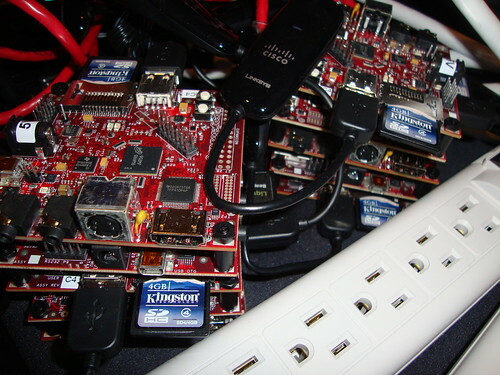 So I took out my trusty Ubuntu Linux laptop, and quickly got it to connect to the wireless G router I'd set up to be the master switch for all 10 of the BeagleBoards. Since the system is running on R, I naturally tried to get some of their default environments running, like Snow, Snowfall, svSockets, and even MPI. But each of those turned out to be serious overkill. Sure, they're easy to use if someone else is installing them for you and you don't have to think about it, but they didn't really get the job done in the amount of time I was willing to dedicate, so I wrote my own scripts. Here are all of the programs I wrote, in one "app" on the "Open Source App Store". I was hired by a company a couple months ago to write data mining algorithms to run on the Open SciCal. Most of them were top secret, but a few were pretty elementary. For instance, one function that is used often in text data mining is a function to extract all capitalized phrases. For instance, Amazon uses this on their website to summarize books with a few phrases. This is a piece of code that you'd often want to run against 1,000's of pieces of text at a time, to extract important pieces of information. I wrote this into a program called "upper.r". For instance: esh "uname -a"
"epush" - "elastic data replicate push" - this takes a set of data files in the data/ folder called "1.txt" "2.txt" "3.txt" etc. all the way up to "10.txt" and copies them over to each node as /home/root/data.txt. This is important if you want to parallelize different data across to each of the nodes. esh "R BATCH < href="http://en.wikipedia.org/wiki/MapReduce">Map/Reduce". If you wrote about parallel computing in the 1980's, you would call it "Distribute/Evaluate/Collect". If you worked at Wolfram Media, you'd call it "ParallelDistribute/ParallelMap". Or if you hacked on the Cray, you'd call it "LoadVec/ParVec/PopVec". At NVIDIA you'd probably call this "CUDALoad/CUDAExecute". Or if you were the CEO of Amazon, I supposed you'd call it "Elastic Cloud Map Reduce" and then you'd make the programming API really obscure and difficult to develop for, and then charge a god-given arm and a leg to use it. They all do the same thing: copy data to nodes, run them, and copy the output back. Step 8: Benchmark and Go! I wrote a couple of benchmark programs that basically run the upper.r code 40 times on a large chunk of text I downloaded from Project Gutenberg. 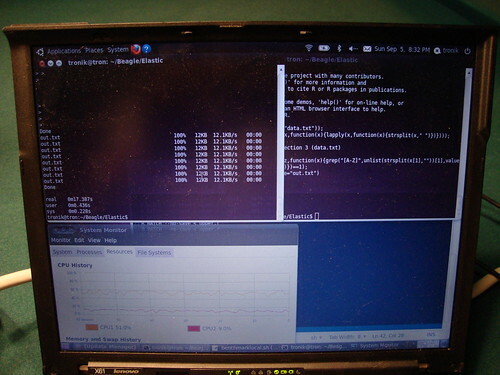 The benchmarklocal.sh script runs the test 40 times serially locally on my laptop. The benchmarkparallel.sh script runs the test 10 times in parallel, then repeats 4 times. The results are surprising to me, at least. The punchline is that, on average, the Dual-Core Intel chip takes ~30-35 seconds to complete the tests, while the BeagleBoard Elastic R Beowulf Cluster takes around ~20 seconds. The sky's the limit. 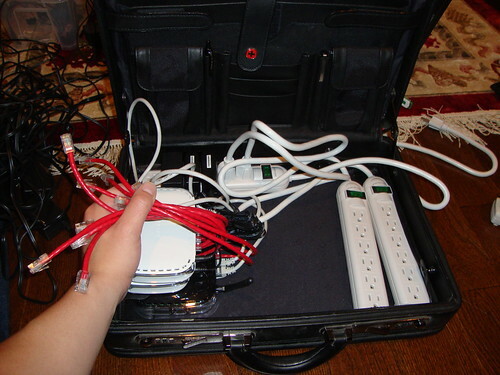 Or rather, the practical limit is my ability to appear socially uninhibited as I bring this suitcase into a conference meeting room, pardon myself as I plug it into the outlet (until I get a battery backup unit), and then run the thing at max speed as I calculate floating point math, and extract long capitalized phrases from anything in the room. 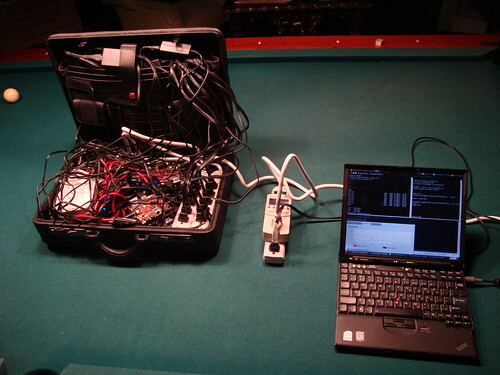 Nice setup, and writeup! I might be using a very similar cluster in a robot soon. Looks like you could use a decent 5V power supply and distribute DC instead. Oh, and I know how much you wish the original BeagleBoards had ethernet ports. Nice job on the hardware. In R you don't need to end lines with ';' and you don't need curly braces in your one-line function definitions. But otherwise good job on bringing R into new applications and new hardware! Way cool, and way different! 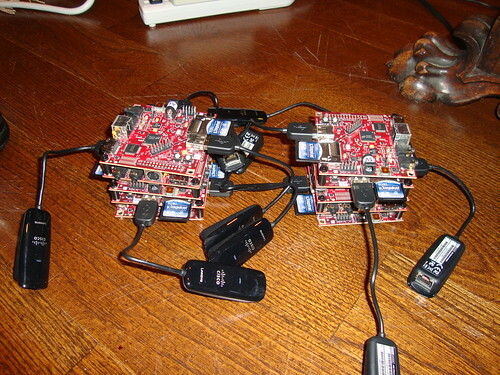 Just out of curiousity, why don't you use the newer Beagleboards for your next cluster? Have you looked at the Gumstix Overo boards? They have a board they call a Stagecoach that networks up to 7 overo board to one Ethernet port. 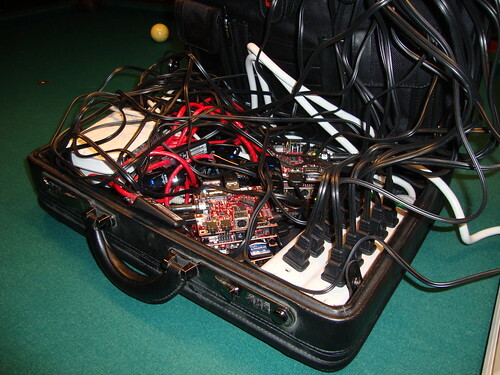 If you use two stagecoach boards with 13 of the base overo and one overo with wifi, you just need 2 power packs and the whole thing would do the same as all those beagle boards and take a lot less space. @vaibhav - actually, the newer beagleboards have a few issues at the moment with their os stability... so although they're technically faster, I'm still hacking through getting them stable... maybe in a few months I'll have that fixed! I'm heading to Maker Faire NY!